This is part of our guide to monitoring in the UK. This page and the following pages explain what companies can and cannot do. Targeting pregnant women and mothers with baby clubs etc. Companies encourage pregnant women and mothers to sign up to their mother and baby clubs. Advertising promotes formula-branded websites. Companies are active in social media with their branded pages and sponsored ads. Danone has claimed that 3,000 mothers are signing up to its Cow & Gate branded club every week – these women then receive emails with promotions such as that shown left, which was timed to the 40th week of pregnancy. 49. Companies will also need to ensure that carelines, websites or mother and baby clubs, and any advertisements for these means of communication, supply only factual information to consumers and health care professionals and, where they constitute advertising comply [with the regulations, that is, no advertising of infant formula, brand names are not made the focus etc]. Companies attempt to side step the restriction on advertising infant formula by asking people to accept disclaimers so it can argue it was responding to a consumer request. However, the ASA has upheld a complaint about a direct email, which the company claimed the mother had opted to receive. 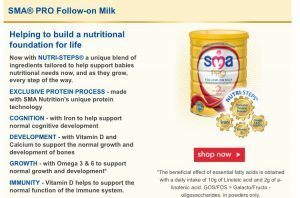 We told [the company] not to produce marketing communications for infant formula except in a scientific publication or, for the purposes of trade before the retail stage, a publication of which the intended readers were not the general public. Gifts are prohibited, though companies sometimes use them nonetheless to encourage people to sign up to clubs. The claims used in promotional emails have been proven to be misleading. 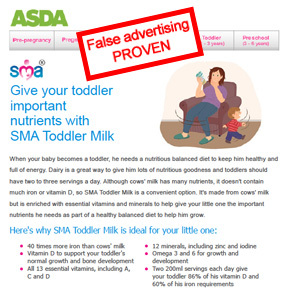 The ASA upheld complaints from Baby Milk Action about claims in an email to the ASDA Baby and Toddler Club, promoting Nestlé SMA formula (ASA ruling A14-263404). People can help Baby Milk Action monitor these promotional channels by signing up to the parenting clubs run by formula companies and retailers. 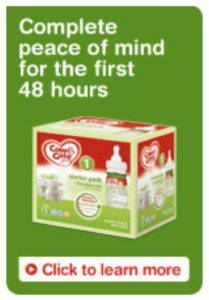 Baby Milk Action will analyse the claims used, which can be outrageously misleading, as in the example below from Mothercare promoting Nestlé SMA follow-on formula (click on it for full email). Their pages on social media also need to be tracked.